Kopapa Cafe and Restaurant is situation on Monmouth Street in the heart of Seven dials, a Covent Garden hub which plays host to a range of restaurants and bars. There is the Michelin-starred L’Atelier by Joel Robuchon and Hawksmoor Seven Dials, but to name a few. Seven Dials also offers a plethora of shopping options and is well know for its boutiques. No wonder then that Kopapa Cafe serves an all day menu, ‘tapas’ style, to cater for the shopping crowds. As with Providores in Marylebone, sibling restaurant Kopapa Cafe remains true to New Zealand born Chef Peter Gordon’s approach to fusion cuisine which blends a mixture of Asian, Middle Eastern, European and American influences. This eclectic approach is one that is rarely seen in restaurants elsewhere and can sometimes come across as a little unconventional. 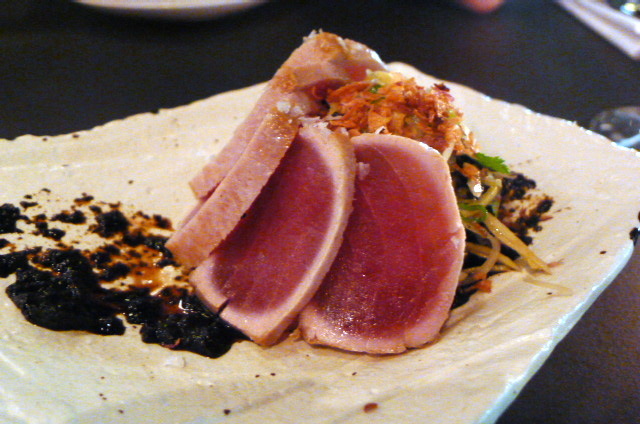 Take for instance, the seared yellowfin tuna (£11.20) which was delicious. But the accompanying nori sauce tasted flat and did not really work with the tuna which needed something with a little bit more acidic zing. A side of green papaya and coriander salad was aromatic and fresh. 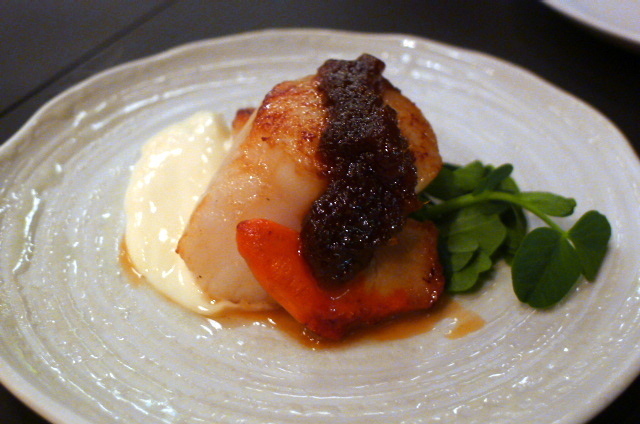 Pan-fried Scottish scallops was beautiful and plump (£8.40). It was served with some crème fraiche and a sweet chilli sauce which was a little overpowering against the delicacy of the scallops. 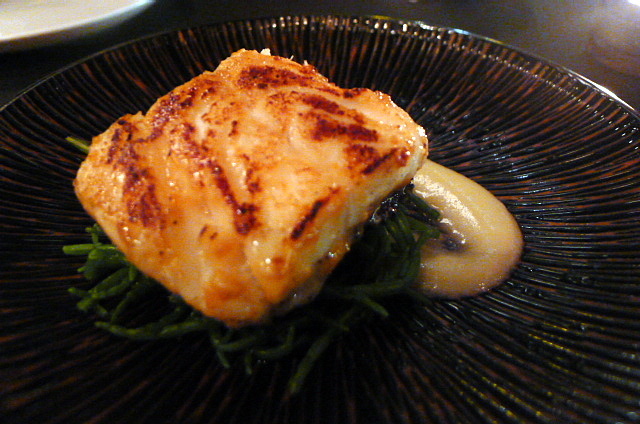 Roast miso cod, lemon purée and samphire (£7.60) was a nicely cooked dish. The fish was moist and flavoursome but lacked for a strong taste of miso. 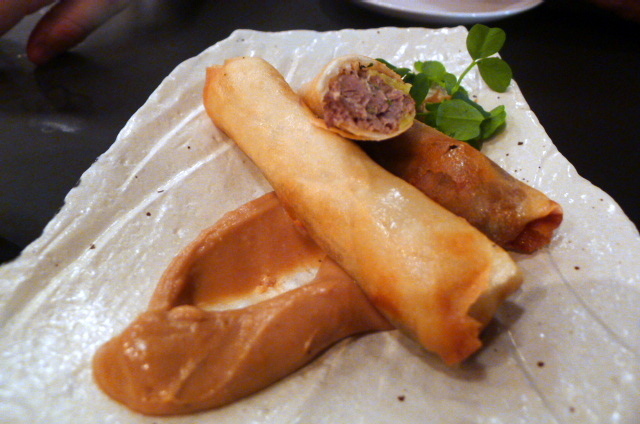 Roasted duck, Sichuan pepper, feta and guindilla chilli spring rolls (£8.10) were scrumptiously tasty. But the tamarind aioli that it was served with dampened, rather then heightened the flavour of the spring rolls. Some hoi-sin sauce might have worked better. 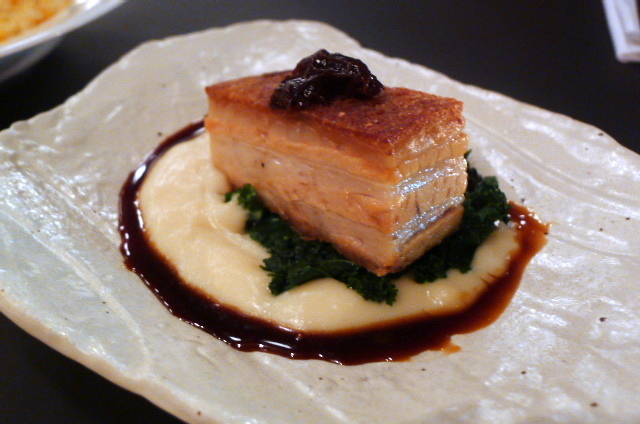 Roast pork belly with parsnip purée, kale, preserved lemon, prune chutney and cider jus (£8.80) was delicious. The pork was moist and flavoursome, and the crackling was extremely crispy. This was a lovely, scrumptious dish. 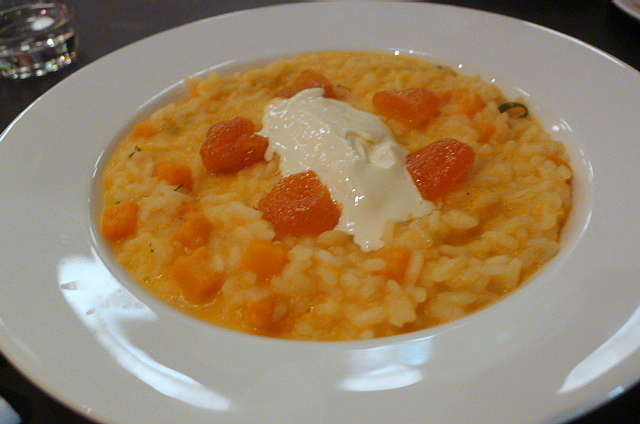 Risotto of butternut squash, smoked garlic, sage and Amaretto mascarpone (£10.50) was creamy but a touch dull. 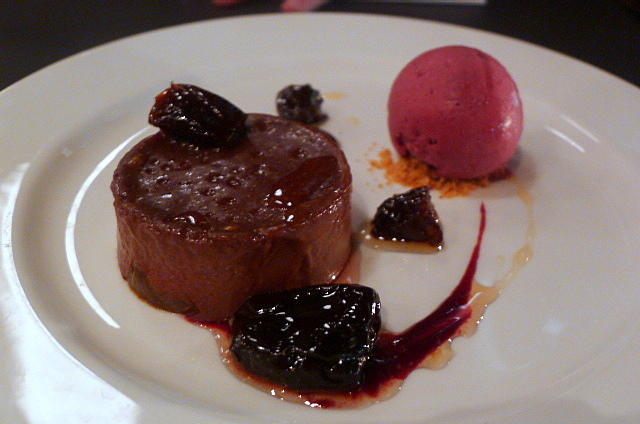 Dark chocolate brûlée with Armagnac prunes and served with cherry sorbet (£7) produced a combination which was too sweet to be really enjoyable. A dollop of crème fraiche might have probably worked better than the sorbet. 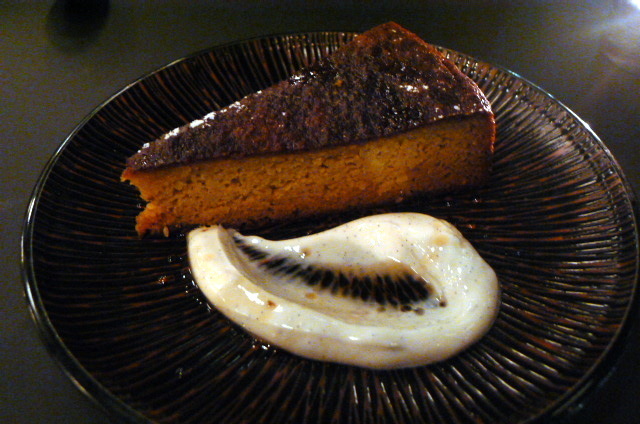 Boiled orange and almond cake (£6.50) was moist and well made, but again the accompanying Greek yoghurt and orange blossom syrup was again too sweet. It’s difficult to rate this restaurant. The service was effervescent, friendly and professional. The cooking was solid and the quality of the ingredients was excellent although the desserts weren’t quite as good. However some of the combinations didn’t gel and this is a really important aspect of a good meal as well. You might love the unusual matching of products and think it incredibly innovative, or then again you might think it odd. I thought Kopapa Cafe was interesting enough to try again. And at least the food gave us lots to talk about during the meal. Price range: Depending on how many dishes you order, about £30 – £45 per head. Excludes drinks and service. AHH getting food horny at the pork belly and the yellow-fin tuna!! Shame about the zing-less-ness.